The entrance to 'The Braes', the Herbert L. Pratt estate designed by Brite & Bacon c. 1912 in Glen Cove. Click HERE for more on 'The Braes'. A Glen Cove old timer told me that the driveway of The Braes was originally "paved" in crushed red brick- and that other than in the wettest weather, any car driving to the front door raised such a cloud of red dust that an army of Pratt maids were obliged to run out and redust the front rooms. 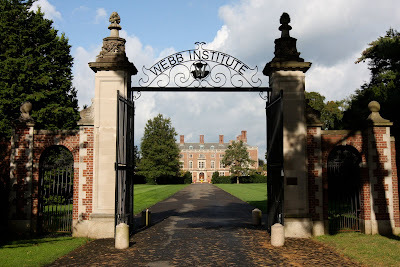 Webb Institute quickly resorted to asphalt. Another old timer who lived further south on Crescent Beach Road told me that as a child in the 1930's he would count the gardeners riding on their bicycles to work at The Braes- they typically numbered 32. They came from "Pollack Hill", he told me and when I evidenced mild shock, he assured me "The Polish people called it that too. My, times have changed on many fronts.